Worldwide shipments of PCs, tablets and mobile phones are expected to reach 2.32 billion this year, a 2.1 per cent increase over last year’s tally of 2.28 billion units, according to Gartner. The analyst firm’s latest figures and predictions suggest that the growth surge in the global devices landscape will be driven by two markets. 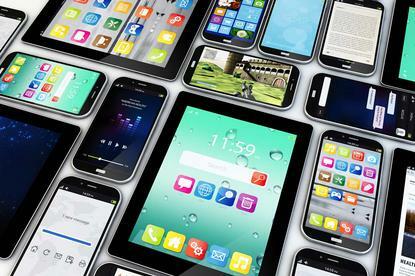 The first is the mobile phone market, led by the high-end smartphone segment. Indeed, Gartner forecasts that mobile phone shipments will increase by 2.6 per cent in 2018, with the total amounting to 1.9 billion units. In 2018, smartphone sales will grow by 6.2 per cent, to represent 87 per cent of mobile phone sales. "We expect Apple smartphone sales to grow by more than the market average in 2018, with the launch of new models fueling stronger replacement cycles," Gartner research director, Roberta Cozza, said. At the same time, the analyst firm anticipates that, by 2021, nine per cent of smartphones sold will support 5G network technology. "Overall, 5G will be a significant driver of video and streaming services, as it will bring faster uplinks and support new AI [artificial intelligence] applications,” Cozza said. The second market set to drive device shipment growth in the coming year is expected to be the premium ultramobile segment. Gartner suggests that this market is seeing thin and light Apple and Microsoft Windows 10 devices stimulate higher demand. In contrast, however, Gartner said it expects shipments of traditional PCs to decline by 5.4 per cent in 2018, continuing the ongoing slump in global shipments of larger computing devices. Specifically, notebooks are showing the steepest decline, at 6.8 per cent, according to Gartner. 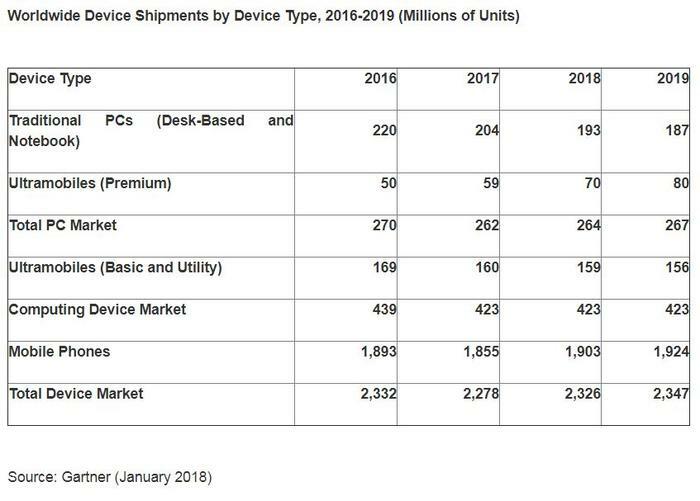 Gartner expects the premium ultramobile market to be the only PC segment to achieve growth in 2018, without which the overall PC market would decline. "DRAM costs have doubled since June 2016, and PC providers have increased PC prices since the first half of 2017," Gartner research director, Ranjit Atwal, said. "This trend is likely to continue into 2018, until DRAM cost trends reverse." "We will see more buyers focusing on value, rather than just price, and therefore considering higher-priced devices,” he said. The latest figures come just weeks after Gartner flagged six consecutive years of decline in worldwide PC and notebook shipments, after closing 2017 with a 2.8 per cent fall. The fourth quarter of 2017 alone recorded a two per cent decline due to weak demand from the United States (US) and in the consumer sector, according to research firm, Gartner. Asia Pacific, however, recorded a 0.6 per cent increase in the fourth quarter of 2017, selling 25 million units, compared to the same period in 2016.